Erika Totten (center) struggles for the microphone to ensure that her voice would be heard during the Justice for All march on Saturday. Billed as a rally against rampant police violence, Saturday’s Justice for All march in Washington, D.C., organized by several civil rights organizations, including the Rev. Al Sharpton’s National Action Network and the National Urban League, faced some criticism in the days leading up to it. The primary concern among critics is what appears to be the purposeful distancing of Saturday’s march from the revolutionary movement that began in August after the state-sanctioned shooting death of 18-year-old Michael Brown by former Ferguson, Mo., police Officer Darren Wilson, while simultaneously benefiting from its momentum. Although there were moments of great emotion during Saturday’s march—particularly when the families of Trayvon Martin, Tamir Rice, Akai Gurley, Jonathan Crawford III, Amadou Diallo, Brown and Garner voiced their gratitude for Sharpton and the sea of supporters who have kept their loved ones’ names alive—the criticism that has followed the event largely proved to be true, and young protesters all the way from Ferguson made sure the world knew it. 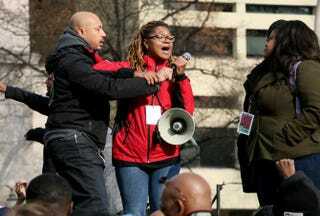 Johnetta Elzie, 25, an activist on the ground in Ferguson and St. Louis who has emerged as a leading voice in the movement, stormed the stage with other young organizers after NAN officials reportedly denied them access. Elzie’s friend and fellow protester Erika Totten got both of them a pass to be on the program. “They gave us badges but didn’t write our names down. They never intended to let us speak. So when Erika said to follow her onstage, we did,” she said. According to Elzie, once she finally did get a chance to speak, they cut her microphone. Elzie’s feelings come from a place that has always been a part of every civil rights movement. For every peaceful speech given by Martin Luther King Jr., there is the image of gun-toting Malcolm X peeking out the window. Both are extreme narratives in the same fight. In the months that followed Brown’s death, the rallying cry of “Hands up, don’t shoot!” was quickly joined by “I can’t breathe,” the last words spoken by 43-year-old Staten Island, N.Y., father of six, Eric Garner, when it was determined that New York City police Officer Daniel Panteleo would face no consequences in Garner’s death. This is a generation of black activists for whom rage is something to be neither quieted nor shamed in the face of continued assaults on black lives. When I asked Elzie about the future of the movement, she said that, despite charges that young people have no direction, they’re doing what they’ve been doing since the beginning. In short, there will be no more business as usual. Business as usual is the refusal to acknowledge that the primary function of peaceful protests is to allow some white people to feel safe in the face of black rage. Business as usual is to hold a march on the nation’s capital against police brutality and not mention the name of one black woman who has been killed by police. What the Ferguson organizers proved today is that from the streets to the nation’s capital, they will shut it down; that business as usual will not go unchallenged. And for that, I salute them. I think we all should.